You would not have guessed the score by the amount of coaching that was going on between at-bats of the Pahrump Valley High School softball team’s 20-0 rout of Chaparral on Monday in Las Vegas. Special to the Pahrump Valley Times Junior catcher McKayla Bartley prepares to make the tag on a Bonneville, Idaho, runner trying to score Friday during Pahrump Valley's victory over the Bees in St. George, Utah. 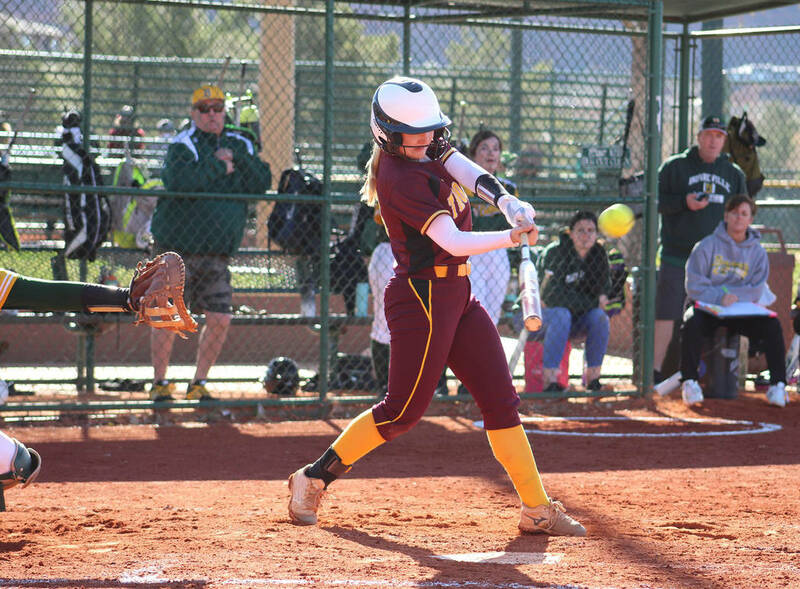 Special to the Pahrump Valley Times Pahrump Valley senior Jackie Stobbe connects for a 2-run home run Friday during a 16-6 victory over Bonneville, Idaho, in St. George, Utah. Special to the Pahrump Valley Times Pahrump Valley junior Skyler Lauver chases a Bonneville, Idaho, runner back to first base during the Trojans' 16-6 win over the Bees in the March Warm-Up Tournament on Friday in St. George, Utah. And that’s exactly how Trojans coach Cassondra Lauver wants it. Sophomore Ally Rily tossed the three-inning no-hitter to get the win, striking out four without a walk. She also went 3-for-4 with a double and drove in two runs. Kareena Nelson was 4-for-4 with three RBIs, and Ana Gonzalez went 2-for-2 with three RBIs for Pahrump Valley. Skyler Lauver was 2-for-3 with a double and a triple for the Trojans. “Everyone that had the opportunity to hit did their job in the box,” Lauver said. “It was really great to get everyone in the game, people off of our bench had at-bats for the most part, and they just came in and it was nice for them to get a chance to do their job. Those opportunities largely consist of situations that might not matter much in a one-sided game but could provide experience for a similar moment down the road. Case in point: third-base coach Rich Lauver came out of the coaching box for a conference with Zaesha Tripp before she came to the plate in the midst of a 13-run third inning, telling her, “Don’t look at the scoreboard. Look out there,” as he gestured toward the loaded bases and noted there were two outs. Tripp responded with a two-run single, meaningless for Monday’s outcome against the Cowboys but a quality at-bat in a key situation. The easy win also got the Trojans back on track after a tough weekend in St. George, Utah, at the March Warm-Up Tournament. Pahrump Valley won two of five games, scoring 44 runs but allowing 40. Regional rivals Moapa Valley and Boulder City also made the trip to St. George, with the Pirates also going 2-3 and the Eagles managing just one win in five games. On Friday, Nelson went 4-for-4 with a double, Jackie Stobbe clubbed a 2-run home run, and Deeanna Egan and Rily each hit two doubles in a 16-6 win over Bonneville, Idaho. 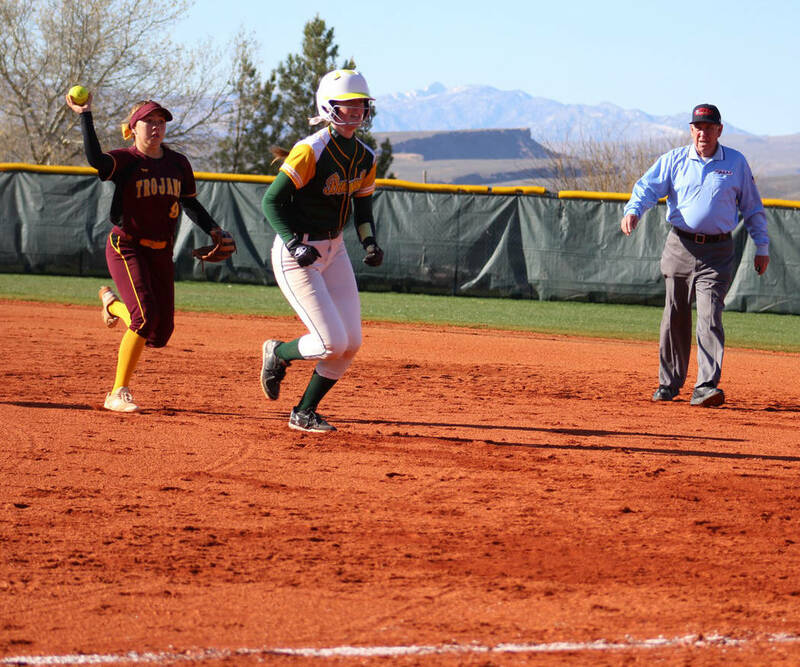 Later that day, Rily tossed a 1-hitter, Nelson and Egan each had a double and two RBIs, and Lauver went 3-for-4 with a double in a five-inning 12-0 win over Green Canyon, Utah. 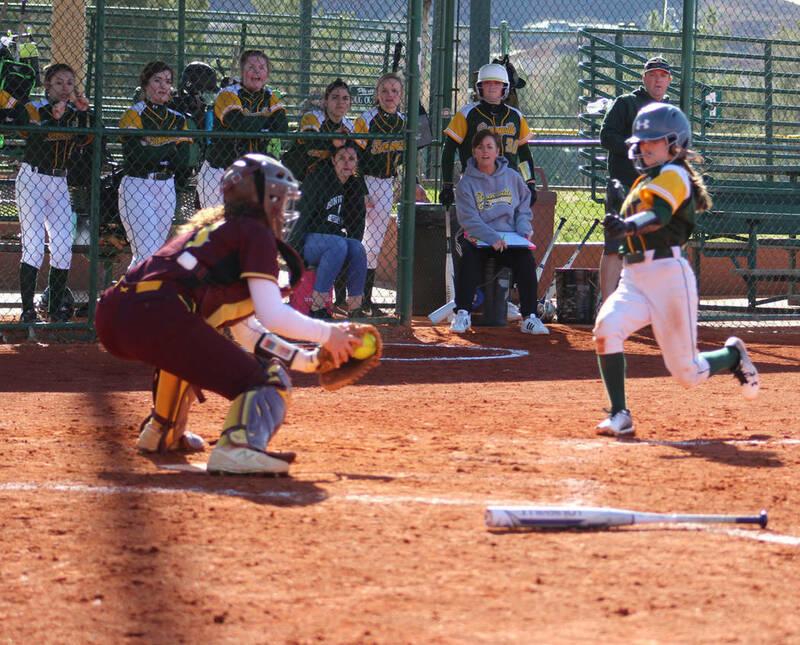 The Trojans ran into a buzz saw in their third game, a 13-2 loss in six innings to Davis, Utah. Lauver hit a 2-run home run and Terrena Martin went 2-for-3 for Pahrump Valley. On Saturday, eight runs in the third inning carried Carbon, Utah, to a 14-8 win over the Trojans. Stobbe had a 2-run home run and three RBIs, while Rily also hit a 2-run home run. Then, Lauver homered and Stobbe and Rily each hit 2-run singles, but Desert Hills, Utah, held off a late rally and took a 7-6 victory. The Trojans (9-4) will be back home for a 3:30 p.m. game today against Virgin Valley before heading to Henderson for a Friday game against Coronado. Also Monday, Cyle Havel tossed a six-inning 3-hitter and struck out nine to lead the Pahrump Valley baseball team to a 12-0 victory over Chaparral in Las Vegas. Jalen Denton went 3-for-4 with a triple, a double and two RBIs, and Chase McDaniel was 3-for-4 with two doubles and two RBIs for Pahrump Valley (5-2).